The Blue Cypress Hotel is located in Arlington, about two miles from Dallas Cowboys Stadium and Texas Rangers Ballpark, which makes it the perfect choice for football and baseball fans. The Six Flags Over Texas and Hurricane Harbor amusement parks are also nearby, ideal for thrill seekers as well. 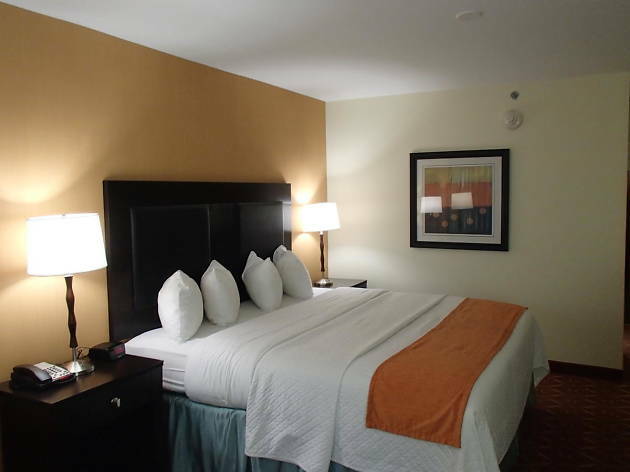 The spacious and well-appointed rooms include breakfast, a flat-screen TV, a safe, coffee maker, free Wi-Fi as standard amenities. Some rooms include a hot tub and a wet bar. Family and bridal rooms are available. Parking is free and the hotel has a no-pet policy. Disabled guests can request accessible rooms. 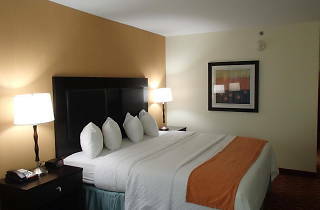 The hotel amenities include a large heated indoor pool, great for relaxing after going up and down rollercoasters or catching a game at the stadium, a business center with computer, phone, and fax service, banquet facilities, a fitness center and a bar and restaurant on site. They also offer transportation to and from the Cowboys Stadium, so you can enjoy your visit to the fullest and not worry about parking.